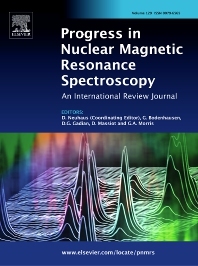 Progress in Nuclear Magnetic Resonance Spectroscopy publishes review papers describing research related to the theory and application of NMR spectroscopy. This technique is widely applied in chemistry, physics, biochemistry and materials science, and also in many areas of biology and medicine. The journal publishes review articles covering applications in all of these and in related subjects, as well as in-depth treatments of the fundamental theory of and instrumental developments in NMR spectroscopy.